The recent article about the orca carrying her dead calf sparked a flurry of media conversation about grief. As the only palliative clinical social worker in an 800-bed hospital (and former bereavement counselor), I am frequently asked by clinicians to help when family is struggling with grief. Requests also come directly from family members seeking help talking to children and understanding their own grief. Regardless of the situation, the underlying desire is the same. Everyone wants to know the “right way” to grieve and ease suffering. Some years ago, Elisabeth Kübler-Ross published her book on death and dying based on her work with terminally ill patients. Despite the wealth of information presented, people mostly remember the stages of grief. And why not? Stages help us to think of grief as a nice and tidy, forward moving process. It is comforting to think that this stage will be over and the next one will take place, hoping the “end” of this hurt will come soon. The book cautioned us that grief is not actual stages and that point has been emphasized since then. Yet, the belief persists that following a death we will go through denial, anger, bargaining, depression, and acceptance, and hopefully in that order. Unfortunately, this assumption can be harmful. So if grief doesn’t come in stages, what does it look like? To quote the youth of today, a “hot mess”. For most adults who experience the death of a loved one, they will move through normal grief reactions without any pathology. What I try to reframe are the expectations we have regarding what’s “appropriate coping”. Sometimes I get called to a family because the patient or family is crying too much; other times it’s because they aren’t crying at all. What I want everyone to know is either response is acceptable. Grief can cause you to withdraw from people and activities, sleep too much or not enough, feel empty, guilty, depressed, and/or lost. Even anticipatory grief (grief occurring before death) has been linked with these symptoms as well as worsened problem solving skills. Contrary to stage theories, these symptoms can occur all at once or in loops. The low part of the loop can be intense negative feelings and then gradually lessen over time. Soon after loss or right before, these loops can be very low, occur frequently, and last for a long time. We hope as time goes on, the upswings lengthen and last longer as those intense painful feelings lessen. It can be confusing for the grieving because just when they think they’re getting better…down goes another loop. Although distressing, these feelings are all very natural and normal and it’s absurd to suggest there is some “right way” to endure it. As hospice and palliative care providers, the goal is to alleviate suffering; but often with grief, some suffering is inevitable. Ongoing grief work is often treated by a balance between avoiding and confronting loss through various activities and tasks. Mental health professionals can employ a variety of interventions through cognitive behavioral therapy, family focused, and meaning making approaches. Although the treatment for normal grief reactions is debated in efficacy, it hasn’t demonstrated any harm.,, Nevertheless, an undisputed and effective treatment for both complicated and normal grief is time. There is no stage or emotion that “should” be felt and there is no timeline. By means of radical acceptance, I encourage patients and their loved ones to acknowledge what is and sit with whatever feeling they’re experiencing. I advise them to stop “should-ing” themselves, as it only worsens the guilt. Sitting with this intensity of distress is hard for those suffering and for those witnessing the suffering. But like the orca reminds us, there are no quick or easy solutions to ease the pain and suffering caused by death. 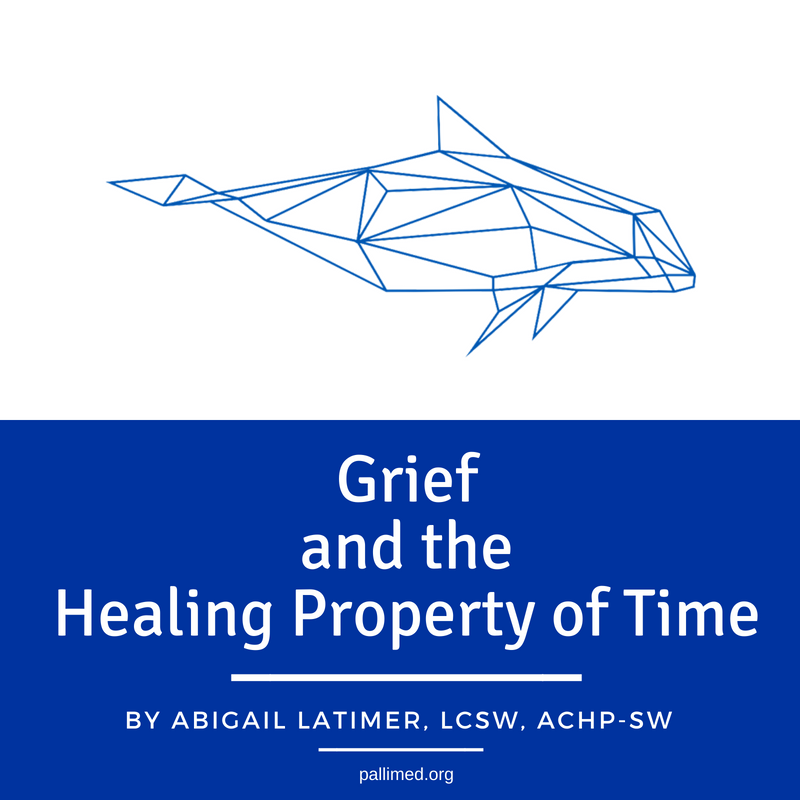 Abbie Latimer, LCSW, ACHP-SW is the Palliative Care Clinical Social Worker with University of Kentucky HealthCare and is also a second year doctoral student with the University of Kentucky College of Social Work. When she's not studying, writing, working, or doing CrossFit, she's likely binge watching old episodes of Breaking Bad and the Office. You can find here on Twitter at @abbie_lcsw. 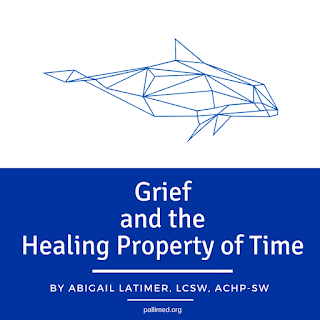 For more Pallimed articles on grief and bereavement, click here. For more articles from Abbie Latimer, click here. For more articles from social workers, click here. Raphelson, S. (2018, July 31). Grieving mother orca carries dead calf for more than a week, over hundreds of miles. Elisabeth Kübler Ross Foundation. (n.d.). Excerpt from Dr. Allan Kellehear’s foreward: “On death and dying”- 40th anniversary edition. Dodd, A., Guerin, S., Delaney, S., Dodd, P. (2017). Complicated grief: Knowledge, attitudes, skills and training of mental health professionals: A systematic review. Journal of Patient Education and Counseling, 100, 1447-1458. Lundorff, M., Holmgren, H., Zachariae, R., Farver-Vestergaard, I., O’Connor, M. (2017). Prevalence of prolonged grief disorder in adult bereavement: A systematic review and meta-analysis. Journal of Affective Disorders, 212, 138-149. Nielsen, M.K, Neergaard, M.A, Jensen, A.B, Vedsted, P., Bro, F., Guldin, Mai-Britt. (2017). Predictors of complicated grief and depression in bereaved caregivers: A nationwide prospective cohort study. Journal of Pain and Symptom Management, 53(3), 540-550. Wittouck, C., Van Autreve, S., De Jaegere, E., Portzky, G., van Heeringen, K. (2011). The prevention and treatment of complicated grief: A meta-analysis. Clinical Psychology Review, 31, 69-78. Jordan, A., Litz, B. (2014). Prolonged grief disorder: Diagnostic, assessment, and treatment considerations. Professional Psychology: Research and Practice, 45(3), 180-187. Clayton, P.J., Herjanic, M., Murphey, G.E., Woodruff, R Jr. (1974). Mourning and depression: Their similarities and differences. Journal of the Canadian Psychiatric Association, 19(3), 309-312. Stroebe, M. and Schut, H. (1999). The dual process model of coping with bereavement: Rationale and description. Journal of Death Studies, 23(3), 197-224. Neimeyer, R. (2014). The changing face of grief: Contemporary directions in theory, research, and practice. [Special Issue]. Progress in Palliative Care, 22(3), 125-130. Larson, D. G., and Hoyt, W. T. (2007). What has become of grief counseling? An evaluation of the empirical foundations of the new pessimism. Professional Psychology: Research and Practice, 38(4), 347. Currier, J. M., Neimeyer, R. A., and Berman, J. S. (2008). The effectiveness of psychotherapeutic interventions for bereaved persons: a comprehensive quantitative review. Psychological Bulletin, 134(5), 648. Jordan, A. H., and Litz, B. T. (2014). Prolonged grief disorder: Diagnostic, assessment, and treatment considerations. Professional Psychology: Research and Practice, 45(3), 180.